DC Glove Company has you covered from head to toe, and Hearing Protection is at the top of the list. We offer a complete selection of Dewalt, Pyramex, and Howard Leight Foam Ear Plugs and Ear Muffs that will satisfy your needs. 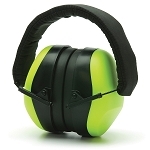 You may require ear plugs with cords or ear plugs without cords, or for the real noisy applications, our electronic ear muffs may be what you need. If you need NRR22, NRR25, NRR27, NRR30, or NRR33 Hearing Protection, DC Glove can provide you what you need. Add an Ear Plug Dispenser, or a box of Laser Lite Ear Plugs, or Reusable Ear Plugs to your cart today.